Guatemala, El Salvador, Honduras. Countries that would let many father- and mother heart shake with anxiety at the thought of their child traveling through ’em. Countries that are famous for their high murder rate, their drugs trafficking and gangs. The hearts of my parents shook too when I told them I would ride my bicycle through those countries. And they still do. The numbers are serious, as are the news items in the media. 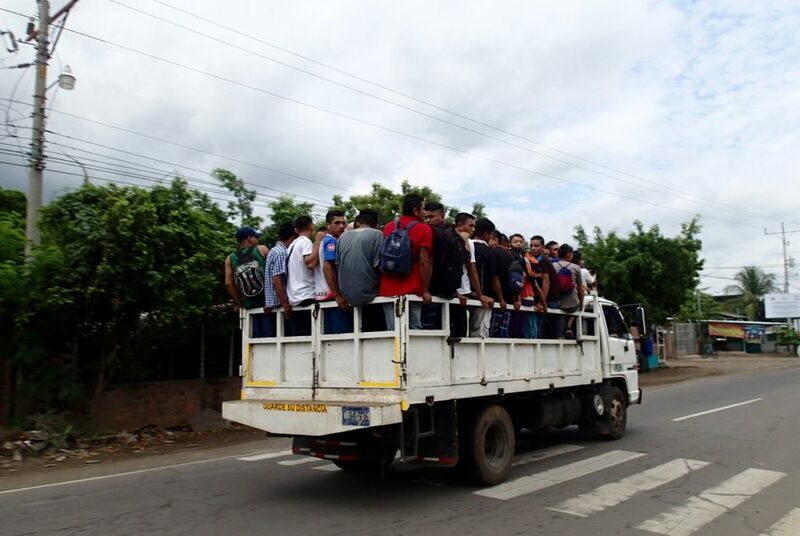 El Salvador only recently had its first day without homicide in two years’ time. Indeed, they are serious, but they also give a very colored view of those countries. Murders, drugs and gangs; that’s the song the media likes to sing. 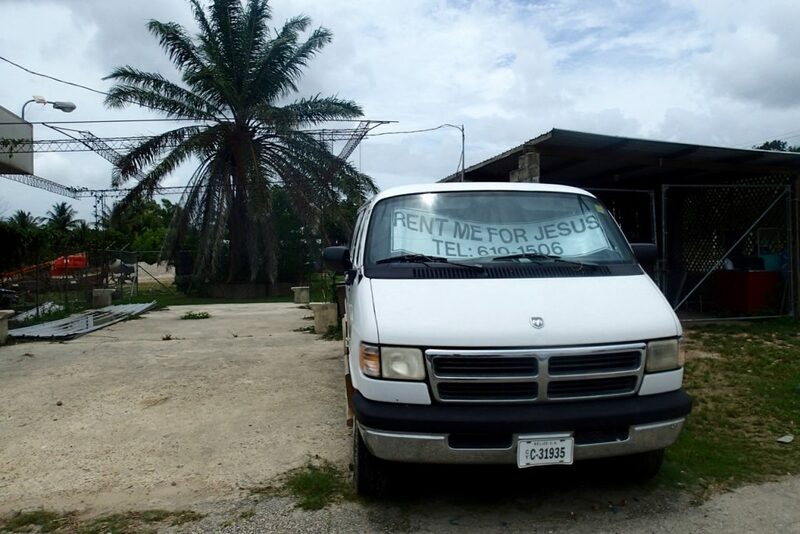 Belize on the other hand is known to be a tourist destination. 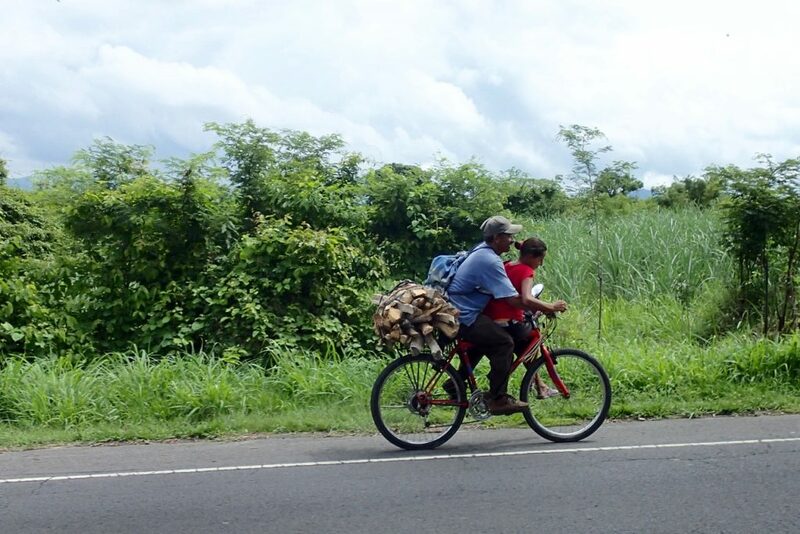 Even though I also received an article from someone with the alarming statement that it’s the ‘country with the highest number of unsolved murders that is not in a war.’ From Flores in Guatemala I cycled towards the Belizean border. Customs were quick and painless and I picked up a free tourist map of the country. Funny how a map with drawn pictures of waterfalls, caves, trees and hammocks instantly makes the country look more safe. That must be the association with a map of Disneyland. On paper it looked like the average tourist destination where you can roam around free and safe. Belize has the ‘Belize dollar’ as their currency, but also uses the American dollar. 2 ‘Belize’ is 1 ‘U.S.’, always. They’re used mixed. 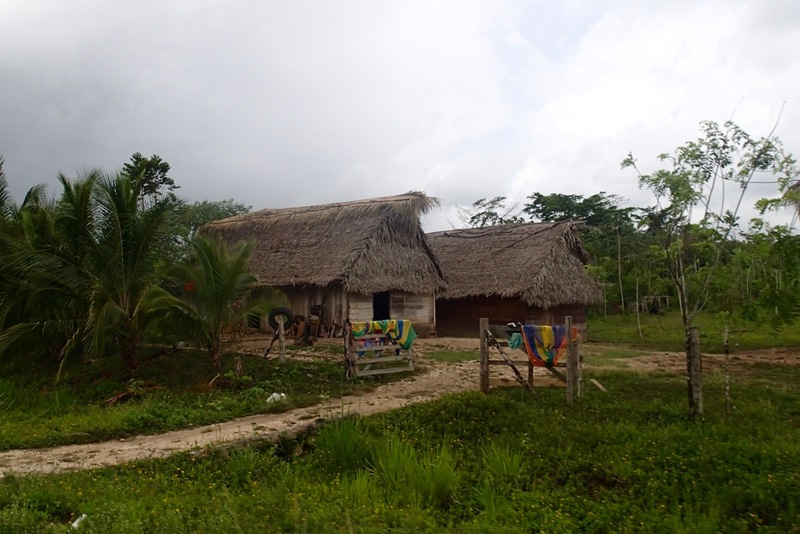 Different from the surrounding countries the people of Belize have English as their main language. 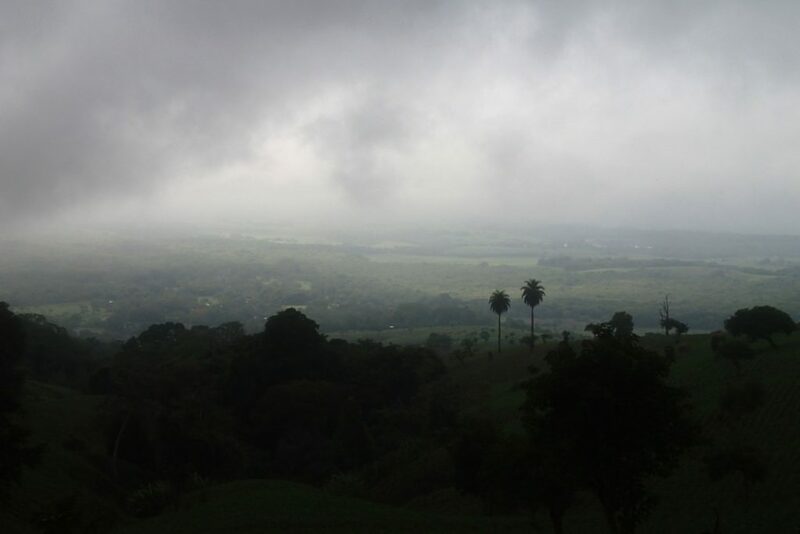 I rode up the Hummingbird Highway, supposedly the ‘most scenic road of Belize’. ‘Nice enough’ I’d say, but not all that special. That it indeed was the ‘most scenic road of Belize’ I only realized over the next days when I was riding long straight stretches through a monotonous landscape. For days I’d been looking forward to drink some coconut water. But every time I spotted coconuts sold on the side of the road I didn’t feel like it was time for a break. Thirsty for a coconut I asked a motorcyclists where I could find some. ‘You can ask here’ he told me and pointed at the little house just behind the bush next to the road. I walked up the muddy property. ‘Hellooooo? Helloohoooooo.’ A young guy appeared and I asked him if he was selling coconuts. He had to check that with this mum. He soon returned with his brother, who just walked up one of the slightly bended trees using his hand and feet like a monkey. He cut loose two big coconuts and back on the ground opened them for me. There I sat on a trunk with two enormous coconuts to enjoy. 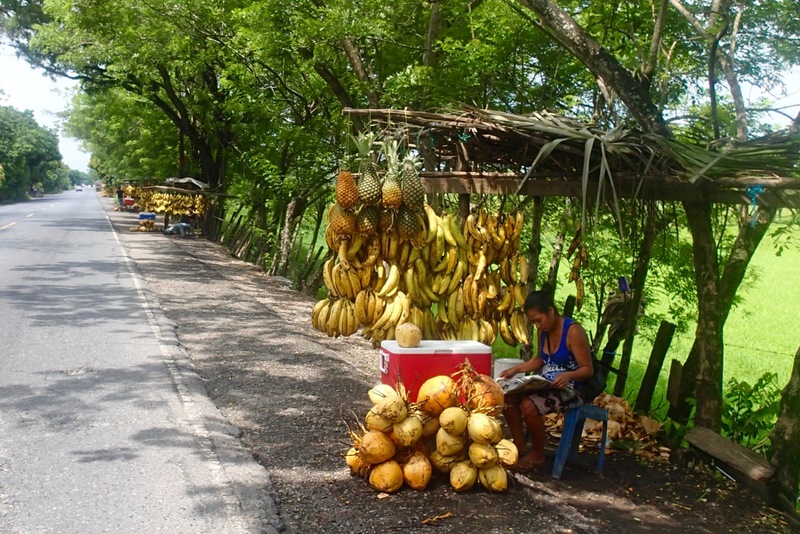 Their mother came out and explained me that they do sell coconuts but per truckload, not on the side of the road. 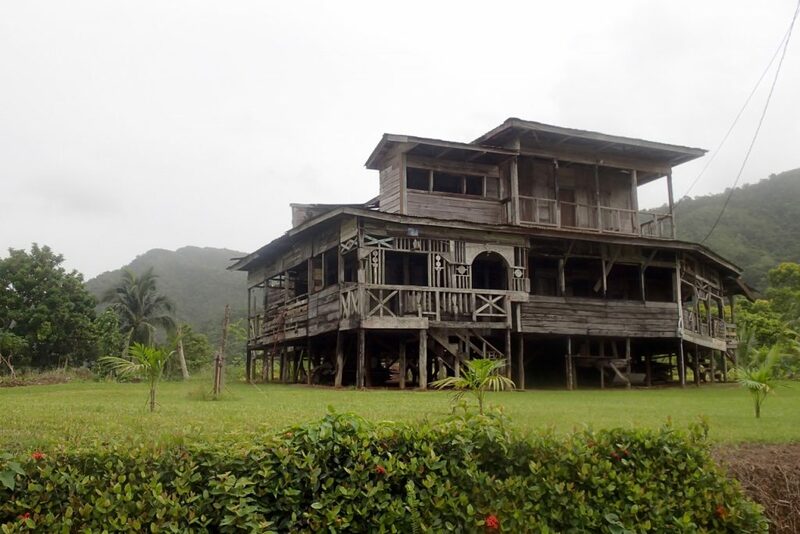 They had a huge property that stretched out for 8 miles behind the house into the jungle. Far too big, she told me. Thousands of coconuts, still they lived in a tiny hut on the black soil. When I was ready to leave they didn’t want me to pay anything for the coconuts. She said to me ‘Most people here when they see a white person they only think about one thing… and you know what that is…’. Belize has more of a ‘tourist vibe’ then the other Latin American countries and white people are more regularly considered as a walking wallet. And not just that, as a white woman you are considered a ‘free for all’ by many men. Without a man on your side (and sometimes even with) you’re degraded to a prey animal, resulting in whistling, getting yelled after, nasty comments and even touching. YEG! During the week I spend in Belize that quickly made me burn with anger. It’s hard to put men in their place when they are not crossing any clear boundaries. Cause what do you do when you’re riding your bike and are being whistled after for the hundredth time or yelled after with ‘Hey baby!’. Sometimes I just want to give ’em the finger without even turning my head, but it feels like too strong a response. Also, I don’t want to let them drag me into that negative atmosphere. The men there aren’t really dangerous but aware or unawares they are without respect for woman. Every time I was called after or whistled at if felt like this men put his hand on my bare leg. As I arrive at a little beachtown called Hopkins I pitch my tent at a simple hostel, owned by an older American lady. A local man helped her with the chores. As I was relaxing in a hammock he came to continue a short conversation we’d had before. ‘I don’t know how you can ride you bike so far’ he said to me. I told him that he had just told me he does long bikerides too (which was BS), so that it should be clear to him. I felt that this wasn’t gonna be a pleasant conversation. He didn’t know what to say to that. All in all he thought it was too dangerous was I do. Later that evening I was relaxing alone outside. He decided to come unnecessary close and said ‘I don’t want you to be sitting alone here’. I told him that I enjoy my quiet time alone. I don’t remember what he said next but I do remember he thought he could rub my arm and put his hand on my back. I instantly got furious. What the hell was he thinking?! I slipped away from under his hand and told him ‘I don’t want to be touched.’ He shied away a little and wanted to shake my hand to show we were ‘okay’. After that he left me alone and didn’t show his face again. A cyclist I met in Flores gave me some good advice. ‘When a man tells you you are beautiful, don’t say ‘thank you’, say ‘I know’. When you say ‘thank you’ you give him power and appreciation, if you tell him ‘I know’ you make him useless and he might even leave you alone straight away. So, this is my new method! Can’t believe I’ve never thought of that…. After a few days in a hammock in touristic Placencia I cross the border to Guatemala again, this time in the eastern part of the country. By now I’m getting used to clouds bursting open and pouring down a heavy long rain shower every afternoon that sometimes keeps pouring till late at night. When choosing my route I keep the advice of a Mexican friend in mind; ‘stay away from railway tracks’. Cause that’s the place where the ‘narco’s’ or the drug cartels operate. The freight trains are used, often by minors, to travel to the U.S.A in search of a better life. 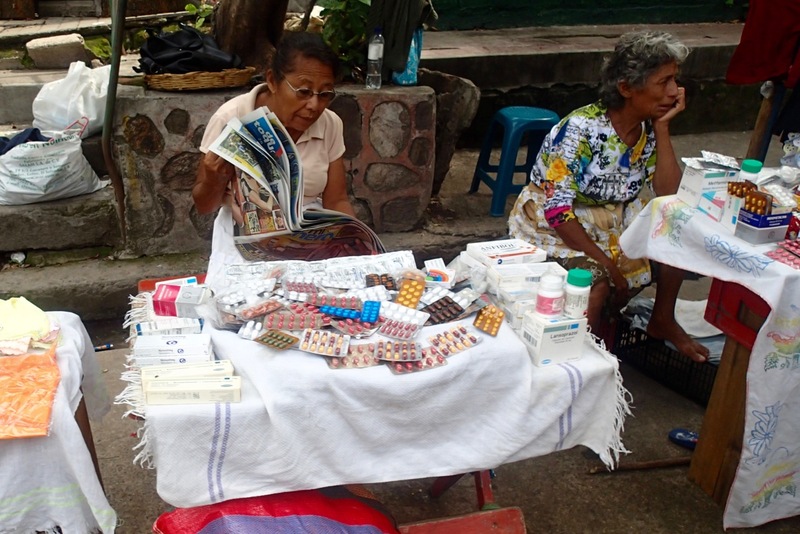 Over the last ten year about 10% of the population of the ‘Northern Triangle’ (Honduras, El Salvador, Guatemala) has left their home country, driven by despair and poverty, often victims of domestic violence. Easy victims for the cartels to kidnap and forcefully recruit. These people disappear without trace and sometimes without being missed. 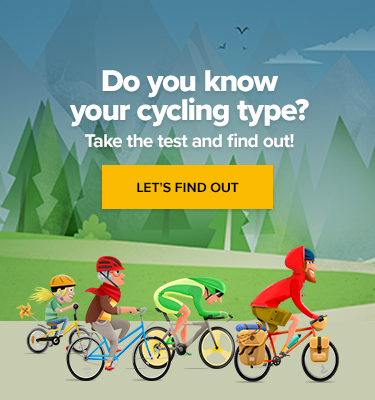 Holiday Bike Renting? Enjoy Your Travels in the Saddle! I remember this when I ask a man for information about a secondary road that runs along the railway. After some information on the road conditions and the lacking of a bridge etc. etc. he whispers loudly that it’s dangerous there because of the ‘bandidos’. Suddenly it rings a bell and I decide to stick to the main road. El Salvador doesn’t have their own currency and uses only the American dollar. A great chance to get rid of some left over cash from the United States. Accommodation turns out to be quite a bit more expensive than in Guatemala. I don’t need much, but it’s still a shame to pay $6 for a hole while in Mexico a room for that price came with a private bathroom. No more wilderness camping. It’s too crowded and I’m aware of the risks here. More so than in Guatemala I notice the difference here between the rich and the poor. The poverty as we see it on TV I watch here walking downs the streets or lying on the side of the road, horrific. While even a dummie like me can see that there are quite a few fancy cars driving around here. The first night I stay in a town just 15km passed the border and from the first moment on I feel that I like this country. The atmosphere is great, there is lots of life, the market zigzags through the streets with familiar and unfamiliar produce, there is fresh cheese again, something brown that they call chocolate and even sort of kind of tastes like it and in the bakeries they sell cookies that don’t taste of cardboard with sugar. Clearly a step up from Mexico and Guatemala. The people in the streets and shops are clearly not used to seeing many tourists and are very helpful but not overly curious. I’m very aware that in my privileged position I shouldn’t complain too much about ‘curious locals’, but I can’t deny that I really enjoy it when I can just join in on the daily life in a foreign country without having to explain my story every break I take. After a few beautiful riding days in El Salvador and with only one day to go to the border I arrived in San Miguel two days ago, where I met Marielos, a friend of a friend of my friend (the triathlete) in Mexico City. 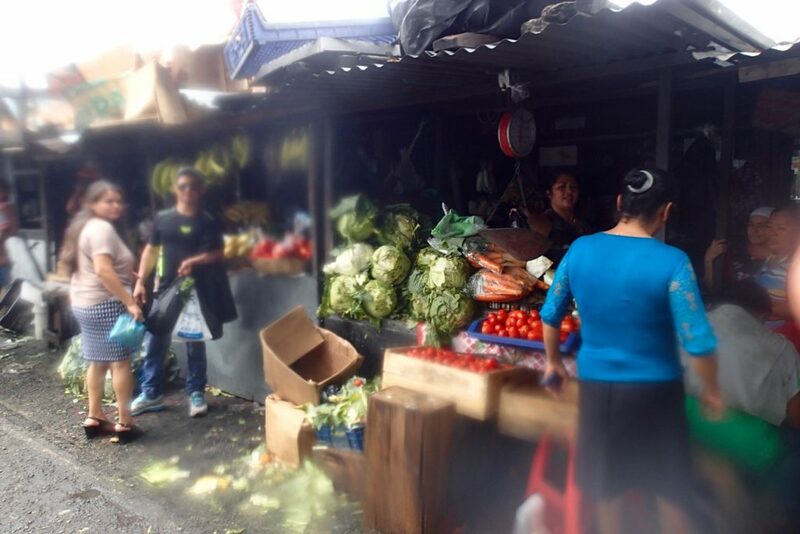 We met at a gas station in the chaos of San Miguel, with 1 million people the third biggest city of El Salvador. We put my bike in the back of her truck and left for a meal and a shower at her house. Talking over dinner there she told me about the civil war. The war that I know so little of but went on for 12 years. The guerillas vs the government. She told me about her sister who was with the guerillas and whose husband and child got killed by the government. And about her friend, who connected me to her, who moved to Mexico fleeing from the war. The war ended in 1992. It’s only 26 years later now and I bike into this country knowing hardly anything about what has gone on here. Here at the kitchen table with this woman, for whom it’s the hard and recent reality, I’m feel a little ashamed of that. After dinner we get back in the car and she drives me to El Cuco, a village at the coast where her family has a ‘summer’house. And here I am in a hammock. Across the gat I see the waves crashing on the beach. Yesterday I’ve swum in the waves for a while, exhausting but wonderful. While I’m relaxing in a hammock, reading ‘The Long Way Round’, about Ewan McGregors motorcycle trip, a TV crew enters the property. The house sitter mentioned something about a friend coming over to make a video but I didn’t expect a whole crew. Marielos must have told them about me and now they’re here to film. I see how the interviewer is pleased and proud when I tell them how much I’m enjoying El Salvador, the beauty and the people. His last question is what I would like to tell other people about their country. The item got broadcasted last night, but as soon as I get hold of it online I’ll share it with you. Since about week now I realize daily that I’ll very soon set foot on Dutch soil again. In two weeks from now I’m getting on a plane. In those two weeks I have three more countries to cross. Even though I’ve traveled quite a bit by now, it’s still hard to get my head around time and distance. I know that when I write this, back in the Netherlands people are just finishing their day at work, it’s 9:56 here, 16:56 at ‘home’. 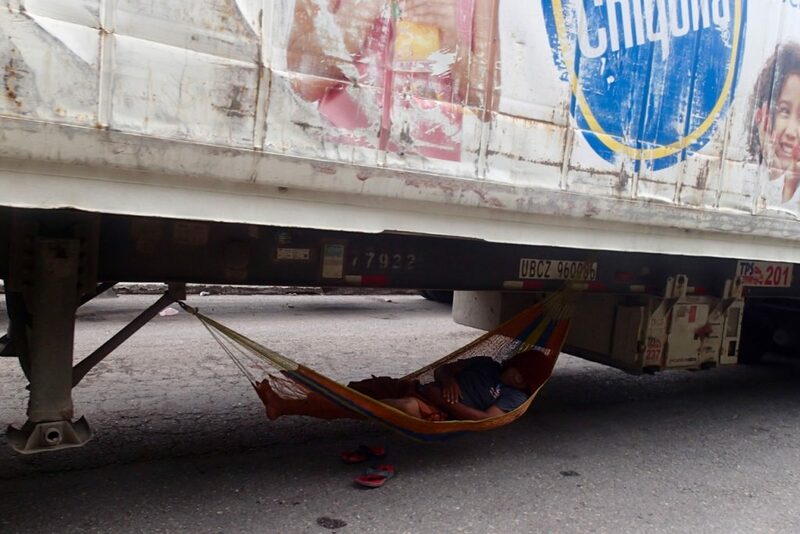 My brother gets home tired after another day constructing roofs and my friends are getting ready for another evening at the climbing gym. It’s impossible to compare my life with theirs. Still it doesn’t feel like I am ‘on holidays’ and they are ‘working’. It’s hard to comprehend how what I do has become my ‘daily life’. And the thought that it doesn’t ‘lead me anywhere’ is both liberating and scary. While travelling I find it easier than ever before to live ‘in the present’, the only moment that matters. With a one-way ticket to the Netherlands in my pocket I don’t control much of the future. Sometimes it makes me nervous that I don’t have a set date on which I’ll leave again, but on the other hand I feel how accustomed I’ve grown to living in the present. My head just blanks when I try to think past my arrival in the Netherlands. I’m looking forward to be in my homeland again. To enjoy my family and friends, the food, the city, the countryside. I feel the same excitement for it as when I’m ready to leave on a trip. At the same time, I’m really looking forward to visit the other Latin American countries first. 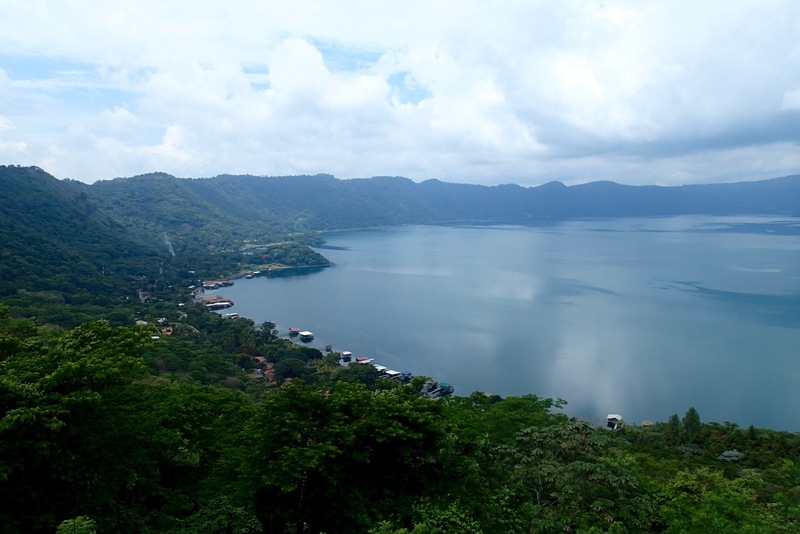 If Guatemala and El Salvador are anything to go with, then two more beautiful weeks await me. Time and distance are strange. At ‘home’ the timescale of two weeks is very comprehendible. Out here I have no feel for it and I can’t imagine that in that time I will visit three countries, love and hate cycling, have ups and downs and despite all the insecurities and bumps in the road will board a plane to the Netherlands on June 29th at 7:00 while my bicycle lies neatly packed in its belly. About this two-week rollercoaster and the happy (well, that’s the aim anyway) end of it I will write next time.